This morning I gave the keynote address for a conference titled: Cold Case Homicide Investigations: Methodology and Protocol, Juvenile Homicide Applications. I was invited by Dave Chortle of the Anne Arundel County States Attorney Office and the Mid-Atlantic Cold Case Homicide Investigators Association. The conference was also hosted by the Naval Criminal Investigative Service Cold Case Homicide Unit (NCIS), and the Magloclen Organization. I had such a great time. Now I’m thinking it was a mistake not to have stayed for a couple of days of the conference. Everyone was so nice and interesting and how can you not love people who do everything they can to solve the murders of children? I believe these people marching are called Plebes. 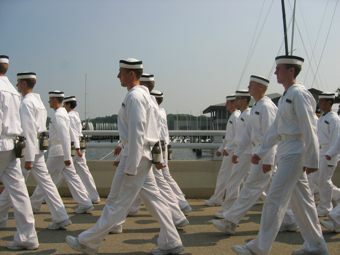 My father is a graduate of Annapolis. I’ve never been there and it was kinda cool to go and to give a speech there. Thank you so much for inviting me, Dave! It was an honor, and you were a great host. And thank you Mike and Len for your help getting me there and helping me set up.